Think British food, then think salads, and it could be argued that vinegar – malt vinegar, that is – has quite a lot to answer for. Used properly it's fine; fine for cutting through the richness of our battered fish and chips. Fine again, when mellowed by long, slow simmering in a dark luscious chutney. But its charms end right there; elsewhere it is a lethal palate anaesthetiser. Take the humble beetroot – generations have been denied the fragrant, subtle, earthy flavour of this delightful vegetable because all the while it was the vinegar that annihilated it. But thankfully, malt vinegar and salads have now parted company. One of the more fortuitous legacies of the foodie-focus 1980s is that, in amongst the more genteel range of wine and designer vinegars (with or without raspberries), the great aristocrat of vinegars, aceto balsamico, emerged, shooting out of the darkness of its former anonymity to blaze forth like a Roman candle sending out a shower of golden rain – or more precisely its sweet-sour, dark amber magic – into the kitchens of the finest chefs on every continent, and from there, ripples of enthusiasm spread out to all who encountered it. You could even say that once it found its way on to the shelves of Sainsbury's, the British salad would never be the same again! Yet for those of us who are dedicated utterly to it, there remains that lurking sense of not knowing exactly what it is, how it's made or what it is that makes it so very special. It was to answer these questions that I set out one frosty January day for Italy, a beloved country and the birthplace of many fine ingredients; this time to Emilia-Romagna, where (provided you are not Piedmontese) you will find the finest of them all. 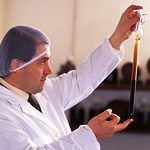 The unfolding drama of balsamico begins in Modena. 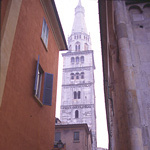 It is a small medieval city, with an appealing combination of those familiar colours of Italian architecture – various shades of mellowed stone mingling with faded pink and coral hues, all coalescing in a cluster of churches, palaces and porticoes. 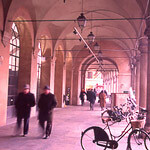 For me, so much of Italy looks like a romantic opera set – but perhaps more so in this case since Modena gave birth to opera's brightest star, Luciano Pavarotti. But that's not all: the Modenese are no strangers to stardom, for it was right here that the world's glitziest sports cars, the Ferrari, the Maserati and the Lamborghini, came into being. But for me, fast cars and opera can take a back seat, for I have only one mission on my mind and that is to uncover the age-old secret of Modena's other 'world first', aceto balsamico. The city itself takes centre stage on a much larger setting, an opulent, fertile plain originally created by two rivers. 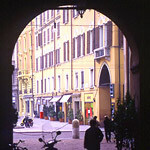 This is mega-foodie country, with (if you're looking west) Parma and Reggio with their world-acclaimed hams and cheese to the front, and Bologna and its famous filled pasta and ragù sauce to the rear, and Modena in the middle. Here, there is also an abundance of wheat and nuts, but the predominant crop is the vine and the hero of our story is the fruit of one particular type of vine – the Trebbiano grape, which grows and flourishes in a distinctive way only in this area. Combine this very rich, fertile soil, once covered by sea, with a microclimate created by the Apennines on one side and the ocean on the other – extremely cold winters, very hot summers and a constant, relatively high humidity – and you have game, set and match for growing special grapes to make a special vinegar. Why? Because this particular grape variety, given these conditions, grows more slowly, takes longer to reach maturity and is harvested much later, in fact as late as they can possibly manage. The result is less tannin, so a much lighter juice is obtained, making it eminently suitable for a high degree of reduction. Add to this a high sugar content (which in turn means a greater depth of flavour) and you have the perfect ingredients for a perfect vinegar which needs to be pungent, sweetly rich and very fragrant. More later of nature's crucial role in this process, but as with any product of rare quality, the vital factor is always going to be the application of human skill. 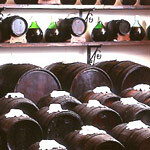 Historically, making balsamico is a family affair, and while the men produced the wine of the area (Lambrusco), the making of vinegar was the woman's domain. 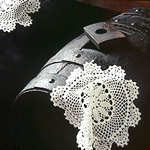 The attic at the top of the house is the vinegar loft and traditionally houses a barrel or two of the precious commodity, sometimes to be offered as a special gift or as part of a bride's dowry. Records dating back to 1046 state that a gift of balsamico was given to the Holy Roman emperor and a consignment of it found its way to England as part of Mary of Modena's dowry when she married James II. 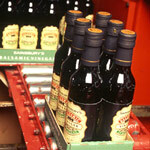 All the same, until the 1980s balsamico remained very much a local ingredient, little used elsewhere even in Italy. 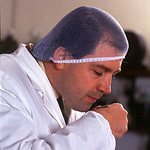 , and this was borne out absolutely when I met the man who makes the finest of all. His family entries have won the annual Palio every year since the early 1970s, often in the face of 1,200 other producers. 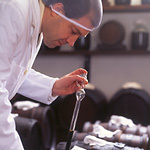 He is Angelo Giacobazzi and his family has made balsamico for over two centuries. 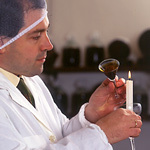 Though he is a qualified oenologist, it was his mother who taught him her secret skills of vinegar making. Angelo is a young, noble-featured, dark-haired man with laughing eyes, and he and his beautiful blonde wife Elda enthusiastically continue the family business. The first thing I learned is that balsamico is not a wine vinegar, but a grape vinegar made from fresh pressed grape juice. How is it made? His explanation of his 'recipe' is lucid, up to a point. The easy bit: first the grapes, mostly Trebbiano with a small addition of Lambrusco, are crushed; then the pure juice – which is called must – is filtered, left to stand then transferred to huge vats (formerly made of copper, now of stainless steel). Wood fires underneath the vat bring the juice up to boiling point and then it is simmered for eight to 12 hours, by which time the whole is reduced to about one-third of its original volume. As it reduces and concentrates, the sugar begins to caramelise and the juice takes on that unmistakably dark, fiery amber colour. Now comes the tricky bit. Balsamico is aged in seasoned wood casks, but these are made from different woods – oak, ash, cherrywood, mulberry and juniper – and each of these has an individual part to play as they give their own distinctive character and colour and flavour to the vinegar. So far so good, but then after one year, when the new grape must arrives, some of the first year is moved on to a barrel containing some second year, and some of that gets moved on to a third year. All that makes room for the new must to move in with the first year – but, just to confuse matters, much older vinegar is added to the new. And then, of course, the various vinegars are changed into different woods to get the right balance of flavour. What's it all about? Well, basically, just three things. While fermentation is occurring during the first year, two separate organisms, yeast and bacteria, are beginning to do their work. They are working simultaneously but in competition – yet they have to co-operate in order to survive. This organic working continues through the years, decades, centuries even, provided there is the third, vital co-operation – that of the vinegar maker, in this case Angelo. Using the skills and techniques handed on to him by his mother, he and he alone organises the blends and continuity. To do this he uses his senses of vision (to constantly check the colour), smell and then taste, all of which tell him what's happening. In his broken English he says, 'I must listen to what is happening to my treasure.' It's this 'listening' that determines what needs old, what needs new, what needs to be topped up. Is the oak flavour too strong in this one, too weak in that? Rather like the conductor of an orchestra, Angelo is in complete control. The whole process begins in the autumn when new must arrives, then during the icy winter months all is quiet while the vinegar begins its cycle of ageing and fermentation with a period of rest. The barrels all have holes in the top to encourage evaporation and concentration – both the vinegar loft and the factory have open windows to allow the fresh air to circulate. Then comes what Angelo describes as the spring awakening, and I have visions of all those little resting enzymes waking up, stretching themselves and leaping into frantic action! All this is spurred on by the warmth of the Italian sun pouring in through the windows, nature working to convert sugar into acid. 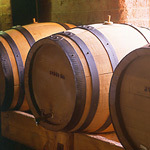 And as the vinegar evaporates and matures, all the while it is increasing its smoothness, richness and depth of flavour. Then comes the autumn and off we go again… As the vinegar concentrates, it is transferred to smaller barrels, and after 12 years some of it joins the select band of traditionally aged vinegars in very small barrels kept in the vinegar loft, along with its 100- to 150-year-old ancestors in Giacobazzi's case (some of this in due time will be used to help along a younger generation at the factory). 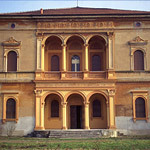 The loft at the top of the elegant Giacobazzi 'Villa Emma' once held another treasure, when the local priest and villagers managed to hide 120 Jewish children successfully from the Nazis during the war. 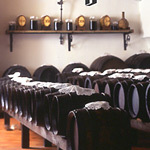 Nowadays it is home to rows and rows of simple wooden casks (with covers hand-crocheted by Angelo's mother) containing generation upon generation of its unique ingredient. The loft is icy cold in January and our feet are numb, but the pungent, caramel-sweet aroma is honestly to die for. We are invited to breathe in the intensely concentrated aroma from the barrels themselves, then we see the colour, then taste the silky, ebony liquid, allowing it to rest first for a moment on the backs of our hands to give it some warmth. It is sweet and fragrant, the sharpness has mellowed with age and there are luscious hints of caramel and fruit with woody overtones. This one is 40 years old, and you can rid your mind of thoughts of recipes or salads – this should be sipped and savoured all by itself. * Digestion. A tablespoonful after a meal is said to aid digestion. * If you are on a low-salt diet, balsamic makes an excellent substitute. * If you boil and reduce three-year-old by one-third, it makes a very good salad dressing on its own (no oil needed). * Drizzle a little into tomato soup. * Sprinkle a little on to ripe strawberries or melon to enhance the flavour. * Use 12-year-old sprinkled over cooked chicken, grilled steaks or chops just by itself. * When frying steaks, use 5 fl oz (150 ml) of three-year-old to rinse the pan and bubble down to a glazed sauce. * Sprinkle on to stir-fries or roasted and grilled vegetables before serving.